The 9th Edition of NALSAR 's flagship moot The B. R. Sawhny Memorial Moot Court Competition is one the prestigious Moot Court competition in India. The finals rounds were on 4th October, 2015. In this moot competition were 71 teams registered and only 32 teams were selected through memorial elimination. Final round was judged by experienced Senior Counsels like Mr. D. Prakash Reddy, Mr. L Ravi Chander, Mr. P. Sree Raghuram, Mr. Raghunandan Rao and Mr. S. Niranjan Reddy. The team comprising of Dhruv Chandora, Prashant Daga and Krati Bhatnagar participated in the Moot Court Competition. Prashant Daga clinched the Best Speaker Award amidst fierce competition from the best universities across the nation. He was awarded a cash prize of Rs. 5000 along with a certificate and trophy. LiveLaw: In one line, how will you tell about the experience of the moot? 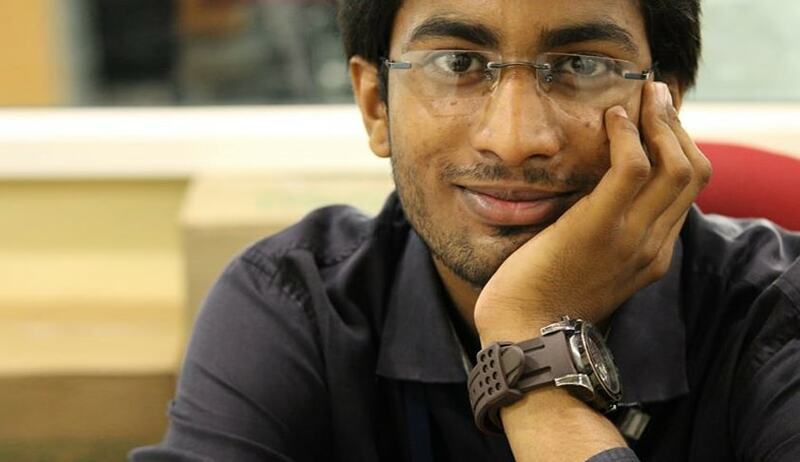 Prashant Daga: It was very good as well as a learning experience. LiveLaw: How and from where did you get to know this moot? Prashant Daga: Since we all have a keen interest in constitutional law, so we always look for the moot propositions that raised unique, challenging questions of constitutional law. This moot proposition was exactly what we were searching for. And about the quality of judges and other aspects we get to know these information from our seniors. I get to know about this moot,from our seniors. LiveLaw: In the oral rounds judge would have been questioned you about your arguments? Were the questions tough and brainteaser ? Comment ? Prashant Daga: Questions that were asked by judges, were not tough but were brainteasing. Some of the questions were expected, some were totally new. So one has to quickly think of an answer at that very moment. Some judges accepted the line of argument or argument structure, some totally discarded it. So we need to think for a totally new argument at spur of moment to satisfy judges. Moreover, it become quit challenging in arguing in front of the benches, who are well aware of all the precedents (not only the ratio but also the facts of the case) that you are citing. LiveLaw: What procedure did the team adopt preparing for the oral rounds? Prashant Daga: As a part of our college scheme, before going on any national moot we are supposed to give 3 compulsory oral pleadings to our seniors. These help in building our confidence as well as making our argument structure more concrete. For oral rounds, team personally, go through each and every aspect of argument that they are supposed to make. The in-depth study of subject matter helps you to answer most of the questions put forward by judges. And beyond 3 compulsory orals, a few orals to each other helps you to further boost your confidence. Moreover, we follow that speaker should not only study his or her own contentions but also that of his co-counsel, especially second speaker. We also, work upon the type of relief we want both interim and final. LiveLaw: Which area of law did the moot problem based on? Prashant Daga: Moot problem was dealing with constitutional law, competition law and patent law. For me personally, this was primarily based upon 2 issues: scope of tribunals jurisdiction or separation of jurisdiction among various courts and quasi-judicial bodies and interplay between private interest and social interest, proper procedure for maintaining a balance between the two. LiveLaw: What was the toughest area in the moot problem? Prashant Daga: Toughest area in the moot problem was when one argues private interest have to be given preference over social interest. This in itself is a weird proposition of law, when seen prima facie, because it is obvious that social interest will prevail. So one has to argue limitation and harmonious balance between the two. It became quite challenging to satisfy judge over this proposition. LiveLaw : What was the most difficult thing the team faced while preparing for the oral rounds? Prashant Daga: Not as such a difficulty but there was constraint of time, as during the period of preparation we have our mid-semester, project submission and for me it was like second national moot in a row so everything was going haywire. Switching from an international law moot to National moot requires changes in mannerism or so. There was times when I used to speak your Excellency or agent while preparing. LiveLaw: How did the moot help you to grow intellectually? Prashant Daga: This moot has helped me a lot in seeing the law from totally different perspective. This moot has helped me in understanding every statute and every law from the constitutional perspective. This has helped me to look at judicial precedent and interpretation of statute from unique perspective. LiveLaw: Is there anything that teams feels that would have improved their performance? Prashant Daga: Yes, there is always scope for learning and improving,we would also like to work a little upon on our oratory. I would like to work upon more on my flamboyancy and vocabulary. LiveLaw: What was the most memorable moment while preparing for the moot that the team cannot forget? Prashant Daga: There are many such moments, but one particular moment that I can recall is when I, Dhruv, Krati and were preparing, we were like cracking jokes, laughing, and seriously were having fun suddenly what we see a guy coming, he asked few questions and moved on. It was 1:00 am, we were like ‘hoga koi student NALSAR ke fifth year kaya LLMka but Next Day what we See is, that guy who was asking some stupid questions in night was actually a judge in our rounds. So it was like yesterday we were laughing at him, and now he will laugh at us when we will be making our argument. LiveLaw: What was the most motivating and inspiring thing that you learnt from the moot? Prashant Daga: ‘Never give up’. And also always believe in second chances. LiveLaw: Did you learn something from the competitors that would help you in the moot you will be participating in the future? Prashant Daga: Yes. I would like to make certain changes in my oratory to make it a little more calm and a little less assertive. LiveLaw: You message to the students that are willing to participate in the upcoming moot. Prashant Daga: mooting may be sometime disheartening but it’s the most learning and fun activity that you can indulge in law school. It gives you feel of Harvey Spector, Alan Shore, Denny Crane and K. D. Pathak while arguing and Mike Ross when researching. Arguing in front of sitting judges, advocates or professors and satisfying them boost your confidence when you make argument in a real court. Moreover, you learn maximum aspects of law while mooting, because like academics it is not contained in water tight compartment. If you want to do it, never do it for winning purpose because win doesn’t depend only upon you but also on various other factors. It may be tiring when you get nothing on a proposition of law but in the end when you are making your submissions and you have successfully made that, you will feel that you have work not only for your inner satisfaction but also for the satisfaction of your fictitious client.So if you want to have the first hand lawyering experience this is the thing! !